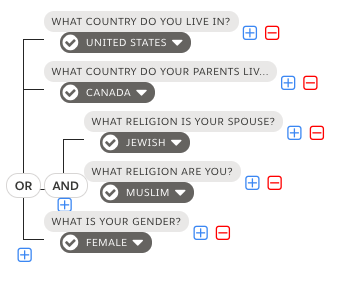 Conditional logic, also called branching or skip logic, helps make your form simpler and easier to fill out by hiding questions that are not relevant to specific answers. You can add conditional rules to individual fields, sections (groups of fields), and pages. A conditional field is a field that is hidden from the respondent's view by default. Once triggered by a multiple choice option, it is visible on the form. To create a conditional field, you must have a multiple-choice field to trigger it. Conditional fields cannot be triggered by text input questions. Try our conditional logic example. Select No to trigger an "Age" text field. A multiple-choice field, also called the trigger field. The field, section, or page that you want to make conditionally appear based on the selection in the trigger field. Select the field you would like to conditionally hide. Open the editing sidebar, and expand the Conditional Rules settings. Use the drop-down list to select the trigger field that shows your conditional field. All multiple-choice options for the form are represented in this list. You may start typing to narrow down your options. Use the full screen option to open a larger view. If you need to show your conditional field when a specific field choice is selected, keep the rule equal [=] to the choice. NOTE: There is a limitation to how many options can be displayed. If you are searching for an option and do not see what you need, try searching by the field label instead of the field option. 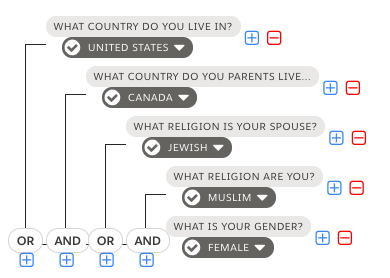 You may also choose to have the rule not equal by clicking on the gray checkmark next to the answer selection. To delete a condition, click the red [-] box to the right. To add additional logic to your field, click the gray [+] button. The conditional field will show if "Yes" is selected for either question. Click the OR button to toggle between AND and OR. The conditional field will show if "Yes" is selected both questions. Once you have begun branching (i.e., once you have more than one conditional rule), you can continue branching by clicking the blue [+] button to the right of the drop-down menu or the blue [+] buttons at the beginning. Yes is selected on the form. 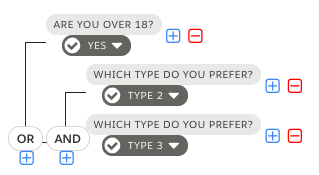 Type 2 AND Type 3 are both selected on the form.